The title of this article is ambiguous. 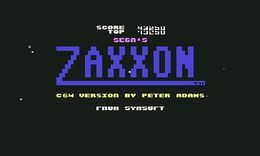 Zaxxon (Disambiguation). 6.91 points at 33 votes (rank 373). Rombachs C64-Spieleführer 9 September 1984 - "Vote 1"
Zaxxon is a classical space-arcade shooter with an isometric perspective, in which you control a space fighter. You need to fly through a strongly secured hostile asteroid town and destroy fuel tanks, gun emplacements, rockets and defence fighters there. With the help of an altitude indicator you need to find your way through narrow wall openings, deadly energy barriers and missile fire. After successfully flying through the asteroid town you get into free space where you need to destroy hostil space fighters. If you survive this, you fly into another asteroid town where the last fight against the treacherous robot, ZAXXON, will take place. If you take this hurdle, too, the game will be continued in the first asteroid town with a higher difficulty grade. Perspective design with many shades and details. By this a virtual 3D-effect is created. It must be mentioned, that the programmer Peter Adams also coded Blue Max a short time before that, which uses the same visual technique. In the first levels of the game you need to fly over walls and over and below enery barriers. In the further course of the game the walls get more compact and there are only small openings to fly through. These openings are then also protected by energy barriers, so that your task gets very hard. Fire your laser at the energy barriers to determine your position in relation to the openings. At the beginning of your mission you get into the first asteroid town. Here you should destroy as many hostile space fighters as possible. The more you shoot the less space fighters you will encounter in free space. Here you should also destroy the fuel tanks to raise your fuel supply. And finally you should also shoot as many radar towers, gun emplacements and missiles as possible to raise your score. After crossing the asteroid town you get into free space. Here you will encounter hostile space fighters and satellites. The size of the space fighters indicates their flying height. The smaller they are the lower they fly. The number of sace fighters to be destroyed is shown in the lower right corner of the screen (EP). If you destroy all hostile soace fighters, you will get a bonus of 1.000 points. If you survive the fight in open space you get into another asteroid town. This is the fortress of the deadly robot ZAXXON. 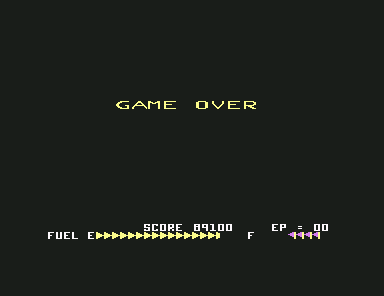 To destroy Zaxxon it needs three hits on his missile launcher. An altitude indicator on the left of the screen helps you to determine your flying height. This is especially helpful when you fly through wall openings and electric barriers. The fuel display shows how much fuel is left in the tank. By destroying fuel tanks in the asteroid towns it is filled up. Always keep an eye open and do not cave in to sleeping needs! The flight through the wall openings gets easier, if you shoot all the time. If the shoots rebound on the wall, you will also crash against the wall if you don't correct your course. 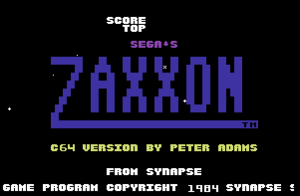 In the title screen (with the blue letters "Zaxxon") press the keys R E D one after the other for as long as it needs until the word "RED" appears in red letters below "Score" "Top" in the upper midldle of the screen. From now on your spaceship is indestructible. 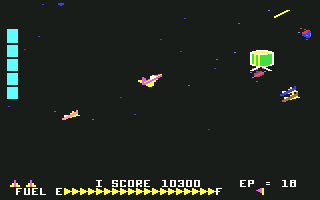 In the title screen press the keys I and D and the spaceship is invulnerable, so that you can fly through all scenes. (Doesn't seem to work with all versions). Rombachs C64-Spieleführer: "The program almost ideally uses the graphic features of the computers. It also makes it to motivate the player by keeping up the expectation for a new nice image for a long time. Alone due to the excellent graphics Zaxxon is one of the best games. (Vote 1, 1984)". Sledgie: "I only agree in parts with Rombach. Concerning the graphics he is right, as the game is from 1984. However, the game does not motivate me much. It is just a shooter with innovative controls - not more. All in all I give the game 6 out of 10 points." 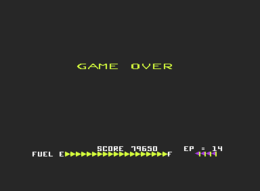 Robotron2084: "The game is scandalously easy! Fortunately, there are space fighting sequences between the space stations where you can lose a life through unfair ramming manoeuvres of the enemies. Otherwise one would have to play FOREVER. Technically is everything o.k. here, only that the machine had completely different grahics and the level buildup was different. 5 out of 10 points." Klaws: "A long, long time ago the machine game Zaxxon set standards by standing out from the at that time common 2D shooters through its isometric 3D graphics (and above all by inclusion of the third dimension into the gameplay!). Unfortunately, this was all; the game itself gets boring very fast. In the area of the space station one easily gets the hang of it and one fights more against the decreasing concentration than against the enemies. Flying through open space is even more boring; for me hitting the enemies was more combined with luck than with skills, and to make the whole thing even more pointless, there were sometimes unavoidable ramming manoeuvres with the enemy. Man, how I hated the space sequences! All in all a neat bore, to which I can only give 3 out of 10 points." 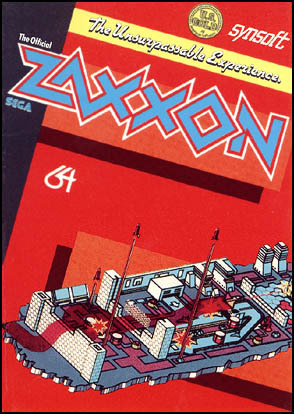 Zaxxon in the Killer List Of Videogames. This page was last modified on 18 February 2019, at 21:04.